Peter played very creatively after the opening. 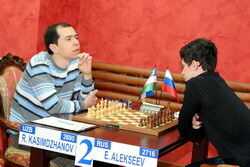 His ‘knight mill’ 24…Nd8!, relocating the knight from с6 to с5, deserves the highest praise. Black lost a pawn, but created strong pressure on e4. Later, however, he incorrectly traded the light-squared bishop. Instead of 27…Bxf5?! Black could continue playing on equal terms by 27…Qb7 or 27…Ncxe4. After Black missed this chance, Kamsky methodically converted his endgame advantage. Svidler built up a solid position with the pawns on e3, g5 and h4, which looked like a fortress, but Kamsky’s mating threats dispersed this illusion. However, in the post mortem it turned out that Gata missed the neat 65...Nf2!, which could indeed construct an unbreakable fortress, but Peter was too tired to resist. 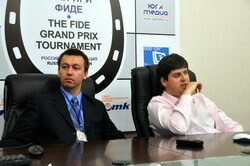 Overall, Kamsky’s victory in this game was quite logical. A head-spinning game. Both players deserve the highest praise. In the Queen’s Indian Defense, Black constructed a pawn ‘barb’ in the center, but fell somewhat behind in development. 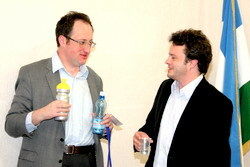 Gelfand decided to use the latter fact. His opening revelation 14.g4! led to enormous complications, which after incredibly precise play of both sides resulted in a complicated ending with White having three pawns for a knight. How they managed to find all the best moves, is almost inexplicable. This was a demonstration of the highest skill! In the mutual time trouble Boris missed an excellent chance. He had to play 38.Kd3! at once (without inclusion of h2-h4 and Ke5-f5), in order to win the game after the most natural 38…Nc5+ 39.Kc3 Ncxa4+? 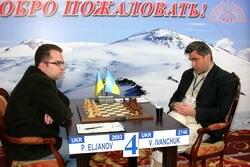 40.Nxa4 Nxa4+ 41.Kb4 Nb6 42.Kc5 Na4+ 43.Kс6. Etienne would have to find the only defense 39…Nd5+! 40.Kc4 Nb7! with just a few seconds on the clock. In the actual game Black managed to stop all the pawns in due time. Another creative game, in which both players showed some non-orthodox ideas. Pavel stylishly solved the problem with his pinned f3-knight by 14.Qb3! Activity of White’s pieces fully compensated for structural flaws. The pressure on Black’s position began to grow... And then Vassily launched a nice saving operation. Black bravely accepted the pawn sacrifice: 20…Rxd4!, and then suddenly gave up a queen for a rook and a bishop. In the resulting position computer engines insist that White has a big advantage, but any human player immediately recognizes a fortress. Game drawn! The logical course of the game that developed around the d6-pawn was shaken by the sharp 18…f5!? This move came as a surprise for Shakhriyar, and the Azerbaijani grandmaster didn’t find the nice reaction 19.h4!, keeping Black’s minor pieces at the bay. The point is that 19…fxe4 20.Ne1! d5? doesn’t work due to multiple attacks on d5 followed by deadly pins on light-squared diagonals. After the exchange on f6 the position simplified (via complications! ), and the players entered a heavy-piece ending. The draw by move repetition was logical. 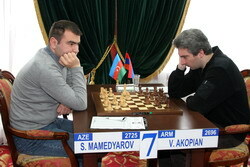 The Armenian grandmaster made an attempt to win the game on sole technique, without any risk. 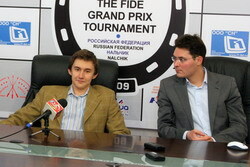 Many time he succeeded doing this, but... not against Grischuk. The Russian consumed a lot of thinking time, but found all the accurate moves that equalized the game. In the English Opening the players quickly traded the queens and several other pieces, ending up in a simple-looking ending with almost symmetrical pawn structure. 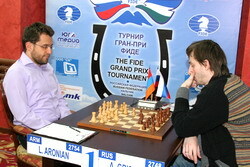 White played a good novelty, suggested in Khalifman’s opening books. It looks like Grischuk was unaware of it, but he managed to find the best moves at the board. Looking for possible improvements for White, I can suggest 22.Nf3! ?, for example, 22…Kg7 23.g4!, and then, if necessary, h2-h4, the pawn goes to g5, and the knight establishes on e5. After White lost a tempo by 22.a3, Black built solid defensive line and held the position.